As you might have heard, ash trees in the UK are seriously threatened by a fungus called Chalara fraxinea, which is a killer. Ash trees across parts of Europe including Poland and Denmark have been devastated by the infection, with up to 90% being killed in some areas. 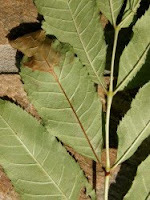 This year, ash trees have been found infected with Chalara fraxinea in the UK. But we can all act now to help save our ash trees, by looking out for ones that are showing signs of infection, then contacting the relevant authorities who can deal with them. Ash trees still have their leaves at the moment, and it is the leaves that can show the first signs of the disease. The Forestry Commission website has details of how to spot the signs and how to report it: http://www.forestry.gov.uk/chalara The photo above right is from the site and shows an infected leaf. The other day when I was walking through my local park, I spotted a young ash sapling with leaves that had dead patches, or leaf necrosis (pictured left. I immediately emailed the arboricultural officer at my local council to tell him about it. He promptly popped over to have a look, and the news was actually encouraging - the tree I spotted probably didn't have the killer fungus. "I have had a look at the tree and we are still looking into identifying the symptoms. My colleague is going to look at it as well for a second opinion. The leaves I looked at had leaf necrosis, but it wasn’t apparent on the leaf vain on the samples I collected. Necrosis of the leaf vain is one of the symptoms. Thank you again for pointing this out. It is nice to know you have an interest and you can identify an Ash tree. We have had calls for Ash tree die back on Oak trees!" He sent me the link to the The Forestry Commission website mentioned above. So, let's all get out into our local parks and woods to spot any infected ash trees so that the rot can be stopped!